Focal and Naim merge to create pan-European hi-fi business | What Hi-Fi? Focal and Naim are to merge to create a new pan-European hi-fi company with a combined turnover in excess of £48m. A new company Focal & Co will own and manage Focal and Naim as independent brands, retaining their own philosophies and product ranges, but collaborating on research and development. Focal & Co, owned by Jacques Mahul (founder and chairman), CM-CIC (long-term shareholder in Focal) and the management teams of Focal and Naim, will employ 325 people at its facilities in St-Etienne, France and Salisbury, UK. By bringing together the research and development teams of both companies, Focal & Co will create "an industry-leading R&D capability to propel the Naim and Focal brands to the next level". Jacques Mahul says: "For future success, the key point is that there is no future for a speaker or electronic company alone. Partnership and collaboration are the way forward both in terms of investment and R&D." Paul Stephenson, managing director of Naim Audio, says: "It is a merger of European minds. 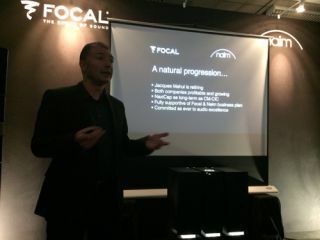 In Focal, we have found a partner which shares our passion for music and will help us take Naim to the next level. "We can achieve far more together than would have been possible alone, yet at the same time we are able to retain everything that is unique about Naim and everything that our customers love us for. "We have some incredible developments in the pipeline and this alliance will help us get those to market as quickly as possible." A Naim spokesperson adds: "A key aspect of this merger is the joint R&D opportunities it will give both companies – a crucial benefit as the industry evolves." The spokesperson confirmed that each company's product lines – and branding – will continue as before. "You're not going to see joint branding on products," they said, also stressing that it's "business as usual" for Naim's speaker ranges. The move comes just days after Naim announced its latest new product, the SuperUniti network music system (news story here).